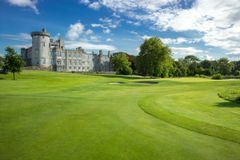 The €5 million investment programme, completed in 2004 by the late Irish golf legend, J.B. Carr, and architect Ron Kirby, has established Dromoland Castle as one of the greatest courses in Ireland. Given the incredible natural landscape of the estate, it was obvious for Kirby to make use of the indigenous features as hazards. As such, the River Rine, and the numerous lakes, marshes and woodland are all obstacles that visiting golfers must negotiate. For those familiar with Irish golf, Carr and Kirby are also responsible for the awesome Old Head at Kinsale, so it should come as no surprise that since its redevelopment, Dromoland has been elevated into the exclusive group of ‘must play' courses in the country. With all this on the site of one of the most luxurious estates around, there are few better choices for a fantastic golf break in Ireland. The newly-established Dromoland Castle Golf Academy is superbly-equipped. During the summer, a large real-grass range is available to test out the conditions as you will find them on the fairways. Dromoland Castle can trace its history back to Gaelic Irish families of royal blood, whose influence seems to have been long-lasting; all visitors to this fantastic estate will experience what life is like as a nobleman. Surrounded by picture-perfect Co. Clare countryside, Dromoland Castle combines the charm and character of the ancient construction with the comfort of top quality modern amenities. Every bedroom throughout the range, from classic to Presidential, is bedecked in the finest furnishings, ensuring that guests benefit from the best in contemporary comfort. In addition to the exquisite accommodation, the hotel and surrounding estate offer endless opportunities for dining, leisure and outdoor activities. If it is luxury that you seek, a golf or leisure break at Dromoland Castle should be at the top of the list. The Spa facility has been updated recently from the original complex, which was located in the Country Club. The development includes 6 brand new treatment rooms, which offer the best in health and beauty therapy, while there is a 17-metre swimming pool, sauna, steam room and Jacuzzi in the fitness centre. Around the estate, guests can try fishing, archery, horse riding, walking, cycling and boating. Dine in the award-winning Earl of Thormond Restaurant, as the resident Harpist provides a soothing atmosphere. The full-time Sommelier will be happy to scour the cavernous wine cellar to find just the right bottle.